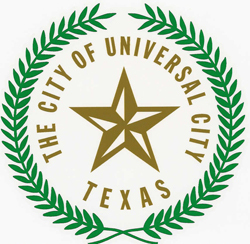 Universal City is located across the Union Pacific Railroad tracks from the main gate of Randolph Air Force Base in northeast Bexar County. Covering 5.7 square miles, the city is enclosed by Randolph and the cities of Converse, Live Oak, Selma, and Schertz. The genesis of Universal City occurred when three San Antonio doctors, Henry H. Ogilvie (1885–1945), Witten B. Russ (1874–1964), and Samuel P. Cunningham (1876–1930), bought farmland in late 1929 in speculation that the future military airfield across the tracks would attract businesses and homeowners. Developer Aubrey Milner named the tract Universal City in 1931 to recognize what he hoped would be the universal importance of the neighboring airfield. The catalyst that fueled Universal City’s tremendous growth was when Headquarters, Air Training Command moved from Scott Air Force Base, Illinois, to Randolph in 1957. Universal City has two major parks, several smaller ones, and has acquired land for several future parks, including a linear one beside Cibolo Creek. The city has two annual civic events—a Snowfest in February and a Veterans’ Day parade in November. Universal city is serviced by two different school districts; the Schertz Cibolo Universal City (SCUCISD) and Judson ISD. College campuses are Northeast Lakeview (NLC) of Alamo Community Colleges and Shekinah academy.